Krzysztof Urbanski (tenor & soprano saxophones), Dominic J Marshall (piano), Sam Vicary (bass), Sam Bell (percussion) & Sam Gardner (drums). The Dance of Venus is a phonographic celebration of life, consciousness and the universe and the group explore the role of meditation and still consciousness in music. The album is inspired by the Quadrivium – the four Liberal Arts of Number, Geometry, Music and Cosmology, studied from antiquity as a means to perceive the beautiful numerical order that characterizes the universe. Bandleader Sam Gardner has studied the Indian classical repertoire of the tabla under the brilliant Bhupinder Singh Chaggar and Jesse Bannister and adapted it for drum kit. There is the little matter of drum studies with Dave Hassle and Gary Husband (in recent years drummer of choice for John McLaughlin) and one begins to see where the amiable young drummer is coming from. Gardner has gigged many times in Newcastle, indeed all of the band have appeared on Tyneside of late (Singh Chaggar memorably so in concert at the Corner House) and the above blurb can be taken as you wish. What counts is the music – and it’s great! Krzyztof Urbanski is an award-winning saxophonist with commendations from the likes of Herbie Hancock, Wayne Shorter and Kenny Burrell. Pianist Dominic J Marshall is another garlanded young musician and the common denominator between he and Urbanski is they are gloriously Old Skool players. Yes, they’ve got attitude (hip hop attitude), why wouldn’t they (so young, so talented)? Eight tracks make up The Dance of Venus. Flowing, turbulent, tight, myriad influences – American jazz, hip hop, Indian rhythms, Latin rhythms (percussionist Sam Bell spent a year in Cuba as a student). Track six – Deimos – encapsulates all that is best about this recording. Superb musicianship (great bass playing by the third Sam, Sam Vicary), the acoustic quality of the studio recording exemplary, five ‘tuned-in’ musicians. Listen to the CD, that’s all that matters. Catch them live, they’re impressive. 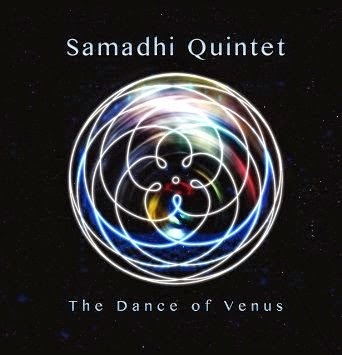 The Dance of Venus by Samadhi Quintet is available now on the F-IRE label (F-IRECD81). Jason Isaacs & Zita Frith @ Bonbar March 29. The Jazz Machine @ The Globe Jazz Bar - March 28. CD Review: Mikkel Ploug Trio - At Black Tornado. CD Review: Carlos Averhoff Jr. - iRESI. The Collective @ Hoochie Coochie - March 19. Jazz Café Jam - March 17. Pilgrim St Set @ Hoochie Coochie - March 12. A superb site to visit. Charlie Parker Remembered Poetically 60 years on. CD Review: Ernesto Cervini - Turboprop. CD Review: Joanne Tatham - Out of My Dreams. Dean Stockdale and Dave Newton at The Globe!